In the six years since head coach Chip Kelly left Oregon for the NFL — he’s now back in the college game, and struggling in his first season at UCLA — it’s been hard to define exactly what is Oregon football. 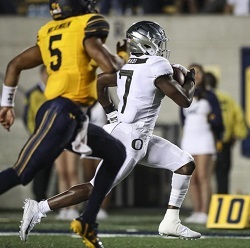 Under Kelly, the Ducks were known for explosive, innovative offense and a defense that was good enough to allow that offense to shine without getting into the kind of basketball-score shootouts you see every week in the Big 12 conference. After Kelly left in 2012, the Ducks were all over the place. They soared as high as finishing No. 2 in the nation with Heisman Trophy-winning quarterback Marcus Mariota in 2014, and sunk as low as a 4-8 record in 2016. In the program’s first year under new coach Mario Cristobal, the Ducks are 4-1 and ranked No. 18 in the nation. Oregon’s offense ranks No. 1 in the Pac-12 conference in scoring (45.6 points per game) and yardage (503.6 yards per game), while the defense is fourth in fewest yards allowed (346.8 per game) and seventh in fewest points allowed (24.4 per game). Tony Jefferson, SS, Ravens (NFL) — After the Ravens scored a touchdown on the game’s opening possession Sunday against the Steelers, Jefferson ended Pittsburgh’s first drive by stripping the ball from tight end Vance McDonald and recovering the fumble himself. Jefferson then ran it back 31 yards for a touchdown, but upon review he was ruled down by contact after it appeared McDonald’s foot grazed him. The Ravens still kept the ball, and that turnover set up another Baltimore offensive touchdown, paving the way for a 26-14 victory. Jefferson also had six tackles. Kenny Robinson, FS, West Virginia (NCAA) — The sophomore safety had nine tackles and two interceptions in the 12th-ranked Mountaineers’ 42-34 victory over 25th-ranked Texas Tech on Saturday. Ha Ha Clinton-Dix, FS, Packers (NFL) — The defining defensive play of Green Bay’s 22-0 shutout of the Bills was Clinton-Dix leveling Buffalo’s top receiver Kelvin Benjamin with a hit in mid-air at the same time Clinton-Dix was securing an interception. Benjamin, one of the league’s biggest and possibly strongest wide receivers, had to leave the game to be evaluated for a possible concussion. Clinton-Dix finished with four tackles to go with the INT. Romeo Finley, S, Miami (NCAA) — Defense carried the torch for ‘The U’ in Thursday’s 47-10 rout of North Carolina. 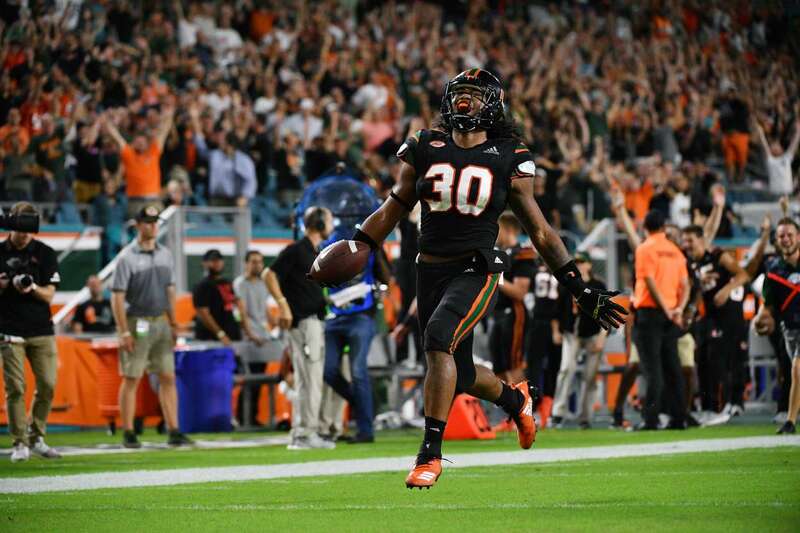 The Hurricanes’ D forced six turnovers and scored touchdowns on three of them, tying a school record, including Finley’s 83-yard pick-six in the fourth quarter. Malcolm Butler, CB, Titans (NFL) — The last time Butler was on the other sideline across from the Philadelphia Eagles, he controversially spent most of that time on the sideline. Butler was infamously and oddly benched for all but one play of Super Bowl LII, back when he was the No. 1 cornerback on the New England Patriots, and the team went on to lose without him. This past offseason Butler signed with the Titans, and on Sunday he record 10 tackles and one sack while helping Tennessee get a 26-23 overtime victory against the reigning champion Eagles. Pic of the Week: Romeo Finley of the Miami Hurricanes runs back an interception for a touchdown against the North Carolina Tar Heels on Sept. 27 in Miami, Florida. The Hurricanes won 47-10.